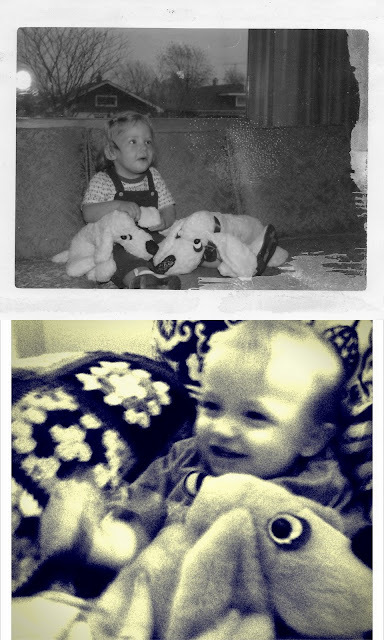 My favorite thing to do as a mum right now is compare old pictures of relatives with current ones of our family. Sometimes if I have similar things from the past that are in the picture, I try to do an "inspired by" photo. 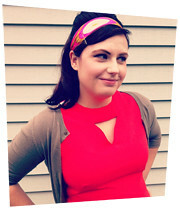 Here are two pictures of my mom from the 50's that I have Wolfgang recreate. The "High Chair" pose. 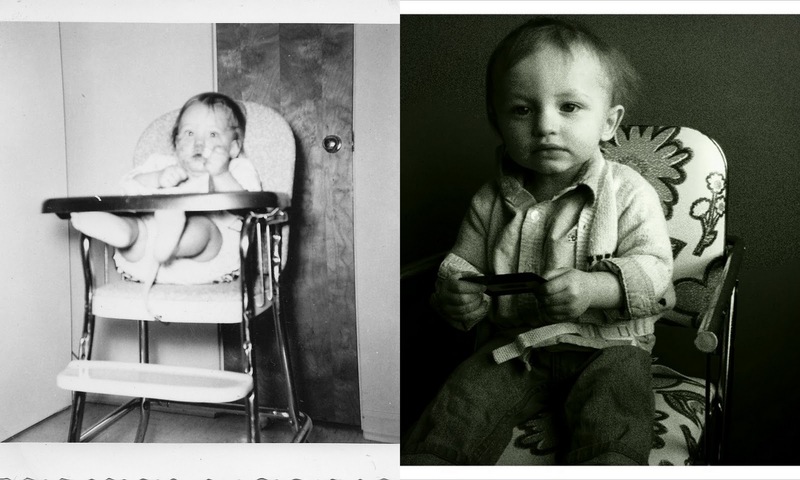 I have a picture of both of my parents (and uncle) sitting in their high chairs around one year of age. So after thrifting this amazing jr. chair for Wolf, I thought it was time for him to get his "High Chair" pictures. The "Morgan Doll" cuddle. On my mom's side of the family everyone of the children were given a morgan puppy dog stuffy (it's a stuffed animal that is shapped to hang over your arm to carry easily). I had a morgan doll as well, but the eyes freaked me out. Wolfgang was given one by his Great Grandma for his first Christmas. He's taken a liking to it and likes to toss it around the room and tackle it. Do you have a special family photo you want to recreate with your child? I would love to see!